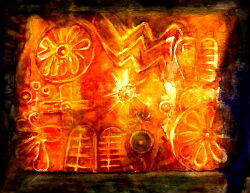 Sally McKenny's art is inspired by the passage tombs at Newgrange, Fourknocks and Loughcrew in Ireland's Ancient East. Her search for sacred space through the discovery of the ancient and holy sites of Ireland takes the form of a journey from the bright sunshine of the American South West to the enveloping mists of Ireland’s ancient holy places. 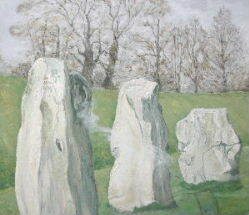 Avebury Seasons by Ric Kemp, a cycle of eight paintings based on Avebury in Wiltshire. Images of six of the eight paintings are displayed, Samain and the Vernal Equinox are yet to be realised. Autumn Equinox at Silbury Hill, Imbolc at Avebury, Summer Solstice shows the zenith sun over the North Cove, Winter Solstice shows the dawning sun on a dark midwinter horizon, Lughnasa shows the ‘first fruits’ of harvest in front of Silbury Hill and Beltane shows girls dancing around a maypole. 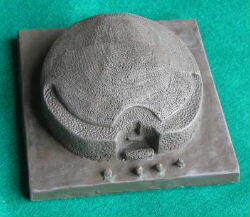 Handcrafted replica stones by Celtic Crafted Stones. Handcrafted in Ireland from Irish Limestone the replica stones are on sale at the Brú na Bóinne Visitor Centre or can be purchased directly from Celtic Crafted Stones. 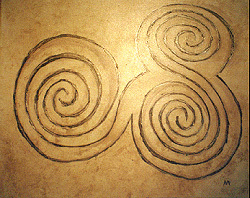 Replica stones include the Newgrange Entrance Stone, Newgrange tri-spiral design, Shella-na-gig and the Janus figure from Boa Island, Co. Fermanagh. Helen Gavigan works in watercolours, acrylics, oils, print and mixed media. 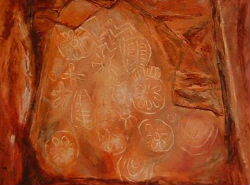 She often takes a stone symbol or pattern as a starting point and allows her work develop from there. Helen is originally from Co. Meath where the cairns at Loughcrew and the passage tombs of the Boyne Valley have inspired her work. The quilt was started at the beginning of September 2004 and the front was finished by the Winter Solstice 2004. Except for the mound itself, it is made of quilting blocks named "Irish chain". 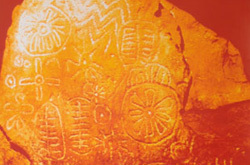 The border has some of the petroglyphs found on the kerbstones around the mound. 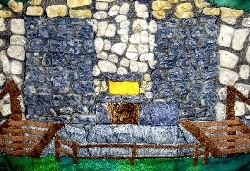 The quilt measures 55 x 25" (137 x 62 cm). Fiddler & The Dolmens by Oliver Curran, painted in acrillic oil on stretched canvas. 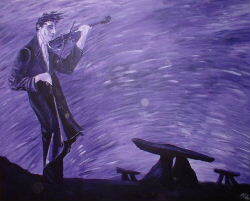 The fiddler laments the warriors graves of Ireland's ancient past. Size : 48 x 78 inches. Handcrafted paperweights and ornaments - no longer available, so all we have to enjoy are the images. 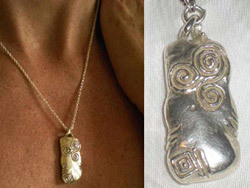 Handcrafted pieces include miniature Ogham stones, Sheela Na Gigs, miniature megalithic passage mounds and dolmens. Richard Moore has been painting in the Boyne Valley for 20 years. He works mainly with oil, and sometimes with watercolour and ink. 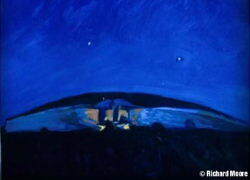 Richard's keen eye, coupled with his great appreciation of the natural, and manmade, environments, combine to give us a unique portrait of the ancient sites of the Boyne Valley. Paintings by Judith Quain - While on a tour of Ireland’s megalithic tombs Judith Quain discovered the beauty of an ancient art of carving symbols into stone. For centuries, myths and legends have celebrated their power, but she was intrigued by the revelation that these ancient cairns, standing stones, and stone circles may be the oldest astronomical observatories in the world, predating Stonehenge and the Egyptian Pyramids. Body Art by Pat Fish who designs and sells original tattoo patterns, including the Newgrange Entrance Stone. 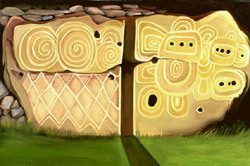 Newgrange and Knowth Petroglyph Paintings by the Artist M.P.Gollon. The Artist has painted the images, hoping to give some sense of this remarkable space/time to people who may not have the privilege of experiencing them in person. 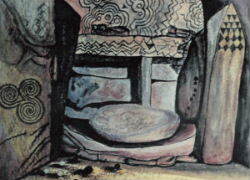 Wonderful watercolour of the equinox sunrise on the backstone of Loughcrew Cairn T.